Multiple Sheets allows you to add more than just one sheet, e.g. floor plans, to a single HoloBuilder project. 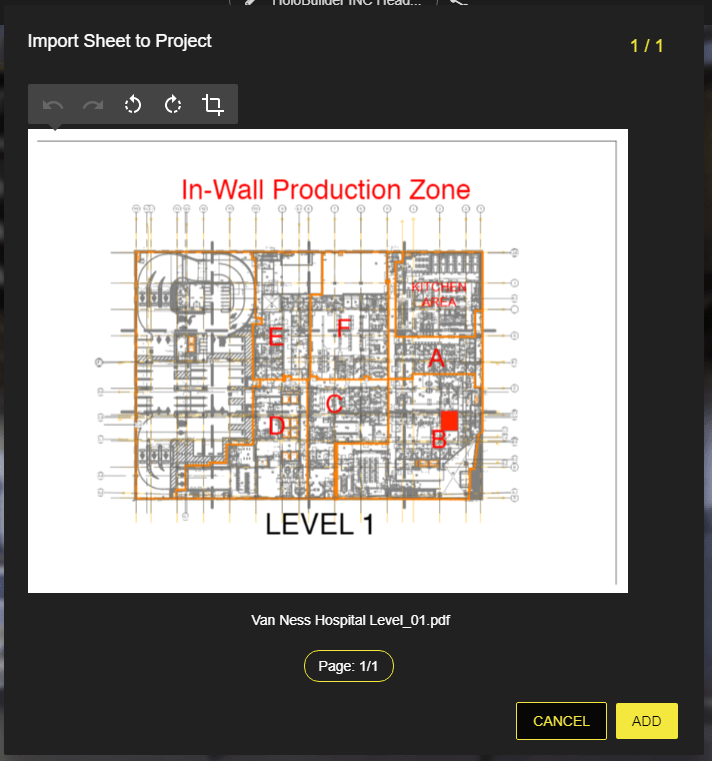 Learn how to upload further sheets (section 1), connect different sheets with your scenes (section 2), manage the sheets accordingly (section 3), merge several projects with single sheets into one project with multiple sheets (section 4), and how to use multiple sheets in the JobWalk app (section 5). An example project of a construction site, which combines the new features Multiple Sheets and Time Travel, can be found here. It is possible to upload additional sheets to a new or an existing project at any time. 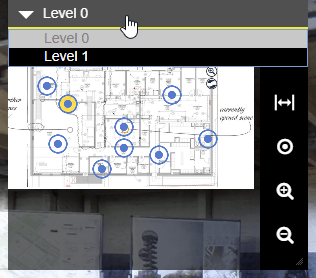 When creating a new project, you can upload any kind of sheets before or after adding the 360° images. Sheets can be uploaded as .pdf, .jpg, or .png. It is also possible to add .pdfs with multiple pages to chose a single page from. To upload any sheets first to a new project, select the register ‘Create Project’ and then the second tab ‘Sheets‘. Either drag and drop the desired number of sheets at once on the highlighted area (as shown in the image below) or click to browse for the files on your computer. It is possible to add one or more sheets at a time. After selecting one or more sheets, the dialogue ‘Import Sheet to Project‘ is shown. Proceed with section 1.3 to edit your sheets. To upload one or more sheets to an existing project or a project already containing any scenes, click on the plus button in the project panel on the left (cf. Figure 2). You will see the menu ‘Choose a new Sphere‘ (cf. Figure 3) as shown in the image below. Select the second tab ‘Sheets‘ and drop the corresponding files onto the highlighted area or click to browse your computer for the files. After uploading the sheet files as described above, you will be asked to adjust and confirm each sheet individually. In the upper right corner, you can see the number of the currently displayed sheet and the total number of sheets about to be added. Below the image of your sheet, you find the name of the file you are currently editing. This name will later be the one shown in the added sheets list. Thus, before uploading your sheets, make sure they are named properly. As shown in figure 4, rotate or crop the current sheet to the desired layout and click the green check mark to save your changes. When finished editing, add the current sheet to the project by clicking the ‘ADD‘ button in the lower right corner. Proceed for each image of your batch upload alike. Additionally, to cropping and rotating your sheet, you can also make it ‘high-res’. In order to make the projects load faster, standard sheets are being automatically reduced in their resolution. For large floor plans, this might make it difficult to see all details. However, your projects will load faster in general. If you really need to see the details on your sheet, you can enable ‘High-res’. By default, ‘High-res’ is turned off. To turn it on, toggle the switch next to the cropping tool from ‘OFF’ to ‘ON’. To view a sheet, simply click on the sheet element in the project panel. The sheet will be displayed in the sheet map next to the project panel. Any uploaded sheets can be found in the project panel. Alternatively, select another sheet to be shown in the sheet map from the drop-down menu of the sheet map. Click on the name of the currently displayed sheet at the top of the sheet map to open the drop-down menu. Select an entry in the drop-down menu to display another sheet (cf. Figure 5). A scene can be filed below a sheet in the project panel but have no waypoint or hotspot on this sheet. Scenes without a waypoint are marked with a gray icon instead of a blue one. Select the sheet the scene is filed under and drag the unattached scene onto the sheet to create a waypoint. Click and hold the scene element and place it to the corresponding location on the sheet. Proceed like described above to place other scenes already filed under this sheet. Click on the corresponding sheet element in the project panel to show it in the sheet map. 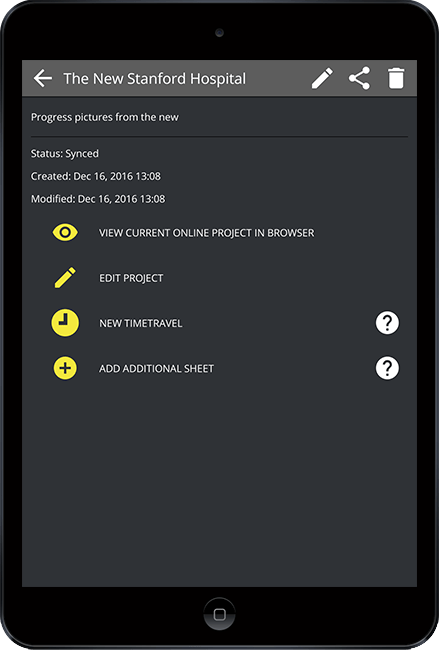 Now, drag and drop any of the unconnected scenes or time-travel scenes from the project panel to the sheet. Release the scene on the location you want to place the waypoint on the sheet as shown in figure 6. Alternatively, you can select another sheet and proceed as described above to assign scenes to this sheet. Scenes that are not yet assigned to a sheet are marked with a gray icon instead of a blue icon (cf. Figure 6). When you have uploaded multiple sheets, you have different possibilities to work with them. The following subsections explain how to change the currently displayed sheet (subsection 3.1), how to exchange two sheets (subsection 3.2), change the corresponding sheet of a scene (subsection 3.3), delete scenes and waypoints from a sheet (subsection 3.4), and remove a sheet (subsection 3.5). To view another sheet than the currently displayed sheet, you have two possibilities. You can either select the sheet in the project panel by clicking on the sheet element directly or on one of the scenes filed under this sheet. click on the sheet or scene in the project panel to show the sheet in the sheet map. Or, you can change the displayed sheet directly in the sheet map. Click on the name of the current sheet at the top of the sheet map, opening a drop-down menu (cf. Figure 7). In this drop-down menu, the names of all sheets of the current project are listed. To select a sheet, simply click on its name in the menu. The scene shown in the background will not change. 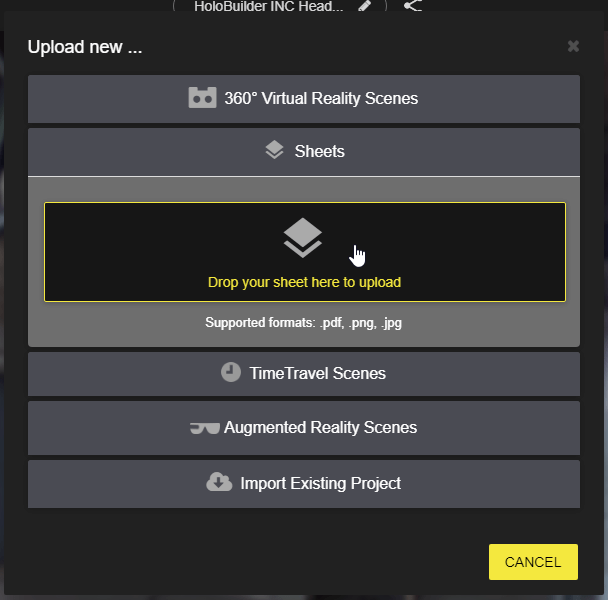 In order to replace a sheet by another sheet for all scenes connected to this sheet, select the sheet you want to replace in the project panel. After the correct sheet is selected, click the ‘Exchange this sheet’ symbol next to the sheet preview at the top of the project panel (cf. Figure 8 above). By clicking on the symbol, a dialogue is opened which allows you to browse for a new file to be used as a sheet from your PC. Edit the sheet by cropping or rotating it and select the green ‘Add‘ button at the bottom of the dialogue. The sheet will be changed for all filed scenes. Sheets can be removed completely from a project. Select the sheet you want to remove in the project panel. After the correct sheet is selected, click the ‘Remove this sheet’ symbol next to the sheet preview at the top of the project panel (cf. Figure 8 above). Confirm. When deleting a sheet that has scenes attached, all waypoints will be deleted as well and the scenes will become loose again. They will not be attached to any sheet anymore. Reattach the scenes to any sheet as described in section 2.2. You can rename your sheets by clicking on the name of it. In the properties dialog, change the name of the scene or sheet accordingly. Save your changes to apply. Additionally, you can change or add a date to for your sheets. Setting a date for a sheet can help keeping track of the right sheet version being used. In the sheet properties, you can also add or change the sheet description. A sheet description can help teams working on a single project to communicate directly about a certain scene or sheet. Add notes for yourself or any coworkers which might have to be considered in further developments. Figure 9: Two options for moving a scene from one sheet to another: 1) Drag the scene element in the project panel to the file under a sheet. 2) Drag the scene element from the project panel on the new sheet in the sheet map. To attach a scene that is already placed on another sheet to a new sheet, select the target sheet in the project panel. Now, click and hold the scene you want to move in the project panel and drop it to the desired position on the sheet in the sheet map as shown as the second option in figure 9 above. Alternatively, you can rearrange the scenes and sheets directly in the project panel. Click and drag the scene you want to move onto the sheet you want it to attach. The waypoint will be added in the exact location it was on the previous sheet (cf. figure 9, option 1). Alternatively, to only remove the waypoint from the current sheet but keep the scene file under the sheet, right-click on the waypoint in the sheet and confirm in the dialog. The waypoint will be deleted but the scene will stay filed below the sheet element in the project panel. To view your HoloBuilder project and the multiple sheets in the player, click on ‘Preview‘ in the upper right corner. 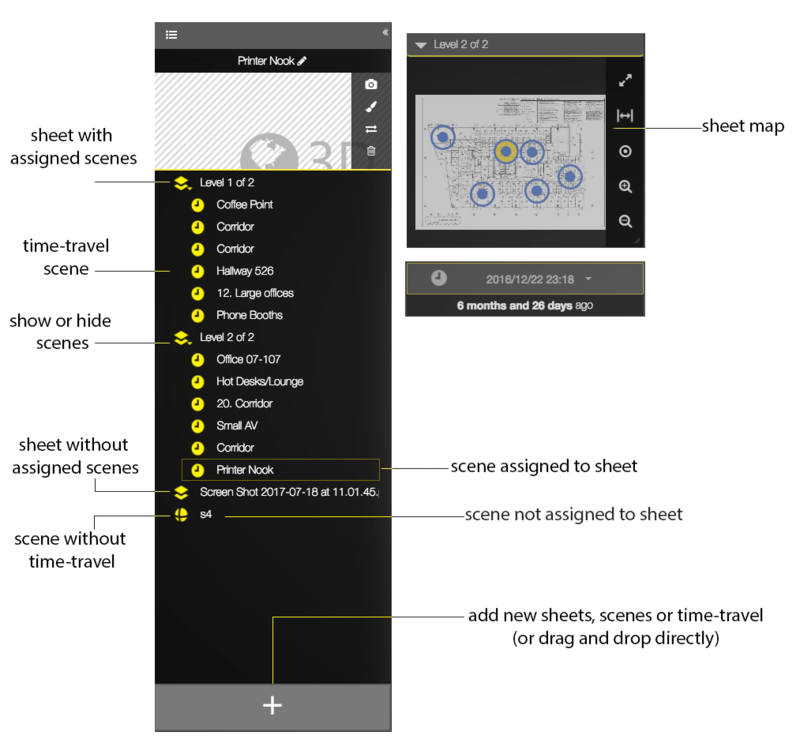 In the preview mode, you can display the different sheets by simply selecting a scene which is connected to the sheet. Select a scene in the project panel on the left. In this case, the corresponding sheet is automatically displayed. Another possibility to change the currently displayed sheet is to click on the name of the sheet at the top of the sheet map, opening a drop-down menu. Select the sheet you want to display from this menu by clicking on it. The sheet will change, however, the scene will stay the same as before. You can now select the desired scene you want to move to from the newly displayed sheet (cf. Figure 7). If you have already created several projects with separate sheets, you do not have to laboriously insert all single sheets from one project into the other. Instead, you can now simply merge several existing projects into one project. A detailed tutorial how to merge projects can be found here. There is also the possibility to use and add multiple sheets in the JobWalk app. A general introduction to the JobWalk app can be found here. 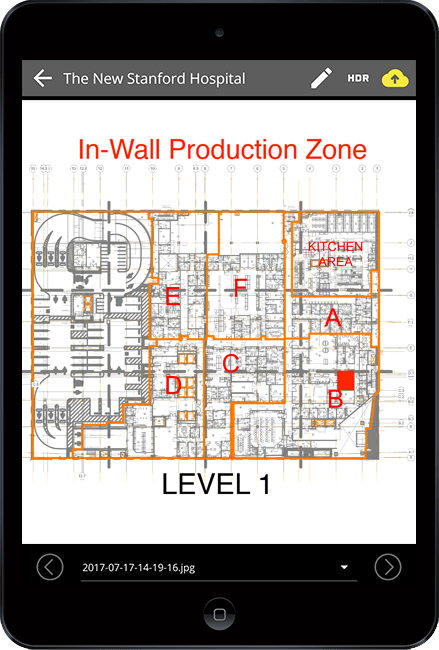 To add additional sheets in the JobWalk app, go to the overview of a project as shown in figure 10. Select the button ‘ADD ADDITIONAL SHEET’ at the bottom of the overview. In contrast to the web application, there is only the possibility to add one sheet after another. Then, you are shown the menu ‘Choose A Sheet‘, which offers you several possibilities to add a sheet, either by taking a photo, picking a file from your mobile device, GoogleDrive, or Dropbox. 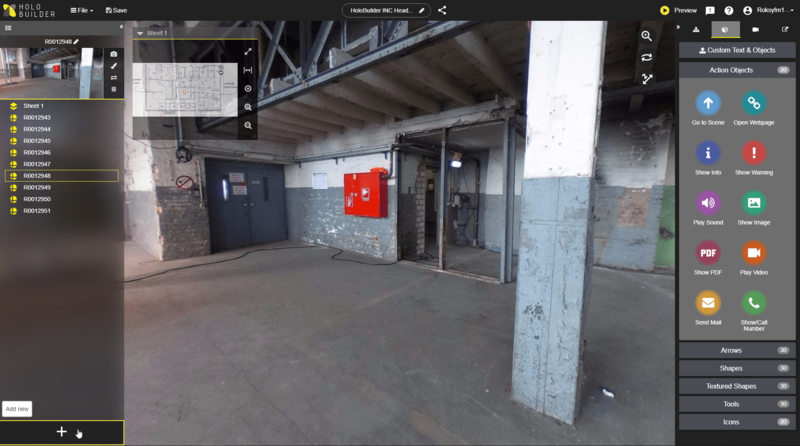 Afterward, you are automatically given the opportunity to add 360° pictures to your current sheet. You can either proceed to add pictures or cancel this part by using the back arrow in the upper left corner. When you now edit your project, a drop-down menu on the bottom of the app shows a list of your sheets (cf. Figure 11). You can either display a sheet by selecting it in the drop-down menu or by using the arrows buttons to change between one sheet and the next one. If you still have any questions about Multiple Sheets or HoloBuilder in general, please let us know by e-mail at support@holobuilder.com or via our integrated live chat on holobuilder.com. This entry was posted in HoloBuilder Tutorials, What's new? and tagged 360 camera, 360 degree camera, 360 degree panorama, 360°, construction, editor, floor plan, Floor Plans, full spherical images, HoloBuilder, HoloBuilder Project, improvement, new features, objects, Project, real estate, Sheet, Sheets, Tutorial, virtual reality, virtual tour, VR. Bookmark the permalink.